Craniotomy is the general procedure that is used to enter the brain. It is used to resect brain tumors, evacuate blood clots and stop bleeding in the brain, clip aneurysms, remove arteriovenous malformations, resect seizure foci within the brain, and treat a variety of other conditions in the brain. It is a stepwise procedure that involves opening the scalp, cutting a skull bone flap, opening the covering of the brain (dura), removing or repairing the offending problem, closing the dura, replacing the bone flap in a secure manner, and closing the scalp. A detailed description of these steps is provided here. 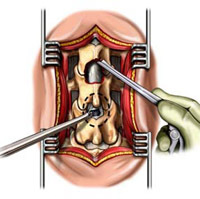 Craniotomy may be (and often is) combined with one or more neurosurgical techniques, such as microsurgery, stereotaxy, minimally-invasive techniques, or image-guidance. Burr holes are small dime-sized holes created in the skull. The are used to remove blood clots on the surface of the brain (chronic subdural hematomas), place ventricular drains or CSF shunts (see below), perform stereotactic biopsies of the brain, implant electrodes in the brain for deep brain stimulation, implant monitors for measuring intracranial pressure, and a variety of other purposes. Electrodes are placed in the brain through burr holes by stereotactic means. The electrodes are connected to a battery that is implanted under the skin below the clavicle. Electrical stimulation of certain portions of the brain called the basal ganglia is used for treatment of Parkinson's disease, essential tremor, dystonia and other movement disorders. Watch a video of deep brain stimulation for Parkinson's disease. Cerebrospinal fluid (CSF) diversion may be performed on a temporary or permanent basis to remove excess CSF from the brain. Temporary CSF diversion is performed via a thin catheter (ventriculostomy or external ventricular drain (EVD)) that is inserted into the brain via a burr hole. The other end of the catheter is brought out through the scalp and connected to a closed sterile drainage bag that hangs by the patient's bedside. This is useful for treatment of acute hydrocephalus that may be temporary (e.g. hydrocephalus after a brain hemorrhage). Permanent CSF diversion is performed via a shunt. Again, a ventricular catheter is inserted into the brain. This time the other end of the catheter is connected to a valve, which is in turn connected to another thin catheter. The second (distal) catheter is tunneled under the skin and inserted into the abdomen (ventriculo-peritoneal shunt), chest (ventriculo-pleural shunt) or jugular vein (ventriculo-atrial shunt). The entire shunt system is internal. The shunt continuously drain excess cerebrospinal fluid from the brain at a rate regulated by the valve. Additional Info about CSF Shunts (opens in a new browser window). Laminectomy is a common spine procedure in which bone in the back part (lamina) of one or more spinal vertebrae are removed. It is most commonly performed for treatment of spinal stenosis (narrowing of spinal canal), but it may also be performed as a part of a procedure to remove spinal tumors, infections or other spine lesions. It may be performed in the lumbar, thoracic, or cervical spine. It may or may not be combined with a fusion. 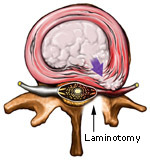 Laminotomy is a smaller procedure than laminectomy (above) wherein only a small portion of the lamina (the bone in the back of the spine) is removed to gain access to the nerve roots and discs. Laminotomy is often performed with microsurgical technique. It is commonly combined with discectomy to remove a herniated disc. It may be combined with a foraminotomy to enlarge the boney tunnel through which the nerve roots exit the spine. Unlike laminectomy and laminotomy, anterior cervical discectomy is perfomed from the front of the neck to access and remove disc herniations, bone spurs and other pathology. The discs are located in front of the spinal cord. The advantage of an anterior approach over a posterior (from behind) approach is that one does not have to go around the spinal cord to get to the discs. An anterior cervical discectomy is commonly combined with fusion and plating. View a video of anterior cervical fusion and plating. For a detailed description of the procedure, refer to Dr. Pakzaban's article for eMedicine on Spinal Instability and Fusion. Lumbar fusion is a procedure in which bone is added to the lumbar spine to stabilize it. It is often combined with instrumentation; i.e. insertion of screws and rods in the spine. It is used for treatment of spinal instability arising from spondylolisthesis, fractures, tumors, infections and other destabilizing pathology of the spine. Microsurgery is the cornerstone of modern neurosurgery. The precision achieved with microsurgery improves outcome and reduces complications in neurosurgical procedures. 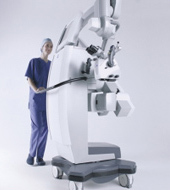 There are three components to a microsurgical procedure: 1) the operating microscope, 2) microsurgical instruments, and 3) microsurgical technique. The operating microscope is a sophisticated device that is suspended over the operative field and provides magnification and illumination of small neural structures. State-of-the-art microscopes, such as the one illustrated here, have internal computers that communicate with stereotactic and image-guided equipment, described below. Microsurgical instruments are delicate surgical instruments specifically designed for manipulating small and critical structures in the brain or spine. Microsurgical techniques are a set of surgical techniques that micro-neurosurgeons are trained to use in connection with microsurgical instruments under the operating microscope. Although most operations at Houston MicroNeurosurgery are carried out entirely or in part via microsurgical techniques, certain operations still require an "open" or "MACRO-surgical" approach. View videos of brain tumor resection and surgery for trigeminal neuralgia performed with microsurgical technique. Stereotactic technology allows the neurosurgeon to find and reach brain structures quickly and precisely based on the location of those structure on the patient's CT or MRI. There are two types of stereotaxy: frame-based and frameless. In frame-based stereotaxy, a frame is first affixed to the patient's skull under local or general anesthesia. A CT or MRI is then obtained. A computer calculates the location of the surgical target in relation to the frame coordinates. A probe is then guided by the frame through a small hole in the skull to the target site in the brain. The probe can be used to obtain a biopsy of a tumor, drain a brain abscess, implant an electrode for treatment of Parkinson's disease, etc. View a video of a frame-based stereotactic operation for treatment of Parkinson's disease. In frameless stereotaxy, small plastic markers are first attached to the patient's scalp. A CT or MRI is obtained before the operation. After the patient is placed under anesthesia, the locations of the scalp markers are registered into a sophisticated computer. 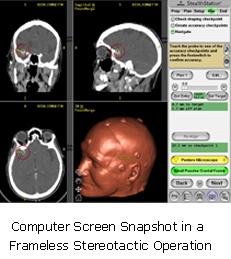 The computer creates a 3-dimensional model of the patient's head based on the CT or MRI and correlates that model with the actual location of the patient's head in the operating room. 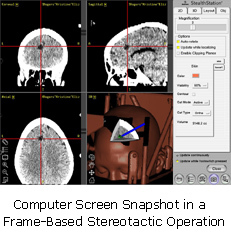 Throughout the operation, using special cameras, the computer detects the location of the surgeon's instruments in the patient's head and demostrates that location as a cursor on the patient's CT or MRI. As the surgeon moves through the brain, he can monitor his progress on the CT or MRI. In this fashion, the surgoen can make sure a deep-seated lesion is reached precisely, a tumor is resected completely, and adjacent critical brain structures are avoided. When connected to a modern operating microscope, the stereotactic computer can even detect the location of the microscope's focal point in the brain and superimpose a virtual image of the tumor (constructed from the CT/MRI) on the actual image of the tumor as seen by the surgeon through the microscope. Stereotactic techniques provide for smaller incisions, greater surgical precision, faster recovery period, and improved outcome. They are not, however, appropriate or useful for all brain operations. Minimally-invasive surgery is a general term used to describe surgical techniques that allow for smaller incisions and less tissue disruption. In general surgery, it often refers to laparoscopic surgery. In orthopedic surgery, it refers to arthroscopic surgery. In neurosurgery, it refers to endoscopic, microsurgical, and stereotactic techniques, used alone or in combination. Endoscopy is a technique in which a fiberoptic probe connected to a camera is inserted through a small opening into the brain or spine. The surgeon views the image on a TV monitor instead of the operating microscope. The surgeon's instruments are then inserted into the brain or spine adjacent to the endoscope to carry out the operation. "Is my operation laser surgery?" Every neurosurgeon is asked this question on occasion, reflecting the misconception that laser surgery represents the state-of-the-art in neurosurgery. In reality, laser surgery plays a relatively small role in modern neurosurgery, reserved for a few specific applications. Microsurgery, stereotaxy, and endoscopy reflect the state-of-the-art in neurosurgery. Intra-operative electrophysiological monitoring is a supplemental technology that allows the surgeon to monitor the function and "health" of a neural structure (such as the spine cord, brain stem, or a particular cranial or peripheral nerve) throughout the operation. A technician attaches electrodes to the patient's head, shoulders and extremities before the surgery. Throughout the surgery, electrical currents are sent into the nerves, spinal cord and brain, and the response of those structures to electrical stimulation is recorded by a computer. For example, during an operation on the spinal cord, if the electrical conduction through the spinal cord begins to diminish, the surgeon is alerted and can takes measures to prevent permanent spinal cord injury. Electrophysiological monitoring is used to enhance the safety of certain operations. Not all neurosurgical procedures lend themselves to electrophysiological monitoring. 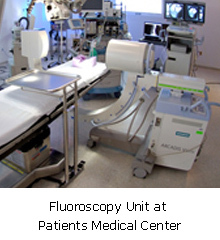 Intra-operative fluoroscopy refers to acquisition of xray images as still images or movies during surgery via a special xray machine called the C-arm. This is particularly useful for certain spine operations requiring placement of metal hardware in the spine. Fluoro-Navigation is a technology that combines fluoroscopic imgaing with stereotaxy (see above) for spine operations. CT scan (Computed Tomography; also known as CAT scan) is used to provide images of the brain, spine or other parts of the body. It uses Xray energy. The patient is placed on the CT table and is moved into a large donought-shaped scanner. Depending on what one is looking for, the CT scan may be performed with or without contrast. For CT with contrast, an IV is placed in the patient's arm and a dye is injected. A helical CT scanner (e.g. "64-slice CT") is a high-speed scanner that can obtain CT images at a very fast rate. This shortens the amount of time the patient spends in the scanner. More importantly, the high speed of image acquisition allows for accurate 3-dimensional imaging and for imaging the flow of blood in the blood vessels (see CT-Angiogram below). MRI (Magnetic Resonance Imaging) is an imaging test that uses magnetic fields instead of Xray energy. Some structures in the body are better visualized with an MRI than with a CT scan. The MRI scanning machine looks like a CT scanner, except that the opening in which the patient is placed is smaller. An MRI takes longer than a CT to perform. Just like a CT scan, an MRI can be performed with or without contrast. MRI contrast dye is not iodine-based. An MRI scanner can be used to image the flow of blood through the blood vessels of the brain, producing an MR-angiogram or MRA. MRI images are degraded by patient movement, so it is very important for the patient to remain still during the image acquisition sequences. The MRI technician will periodically give the patient rest periods, during which the patient can move a little in the scanner. MRI scanners come in "open" and "closed" varieties, with the latter having smaller openings for the patients. Although claustrophobic patients may prefer the open variety, it is important to know that closed MRI scanners generally provide significantly higher image resolution and are more appropriate for neurosurgical decision making and pre-operative planning. The vast majority of claustrophobic patients can be made comfortable for a closed MRI by taking a sedative pill before the procedure. Patients with pacemakers and certain other types of metallic implants can not undergo an MRI. Some neurosurgical metallic implants are designed to be MRI-compatible. A CT-myelogram is a two-component test for imaging the spine. During the first stage, a radiologist places a needle in the lower back (lumbar spine) and injects a dye into the spine. This is usually performed under local anesthesia. The table carrying the patient may be tilted to allow the dye to travel up the spine. Xrays of the spine are then taken. During the second stage, the patient is taken to a CT scanner and CT of the desired region of the spine (cervical, thoracic, or lumbar) is performed. A CT-myelogram may be used to further evaluate the information obtained from an MRI of the spine, or may be performed as the primary imaging test in patients who can not undergo an MRI. Occasionally patients may develop a "post-LP" headache after the CT-myelogram, caused by leakage of spinal fluid from the spine into the surrounding tissues. This type of headache is more severe when the patient stands. Usually the headache improves with bedrest and drinking fluids. If the headache is severe, the patient should inform the radiologist, who can perform a "blood patch" to stop the headache. A blood patch is a small procedure in which a little of the patient's own blood is injected into the lower back to seal the spinal fluid leak. 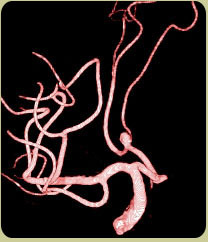 An angiogram is used to visualize the blood vessels of the brain (or spine). A radiologist inserts a thin catheter into the femoral artery (in the thigh) or some other appropriate artery and navigates the catheter through the blood vessels of the body to the arteries of the neck. A dye is injected into the brain and Xray images of the brain arteries are taken. Special computer programs can then be used to create a 3-dimensional view of the patient's arteries, such as the one shown to the right. A CT-angiogram is different from a regular angiogram in that there is no need for inserting a catheter into an artery and navigating the catheter to the neck. Instead, the dye is injected into the arm through a regular IV. A high-speed helical CT machine is then used to image the flow of blood through the arteries of the brain. Three-dimensional images like the one below are produced. If higher resolution is needed, a regular angiogram must be performed. EMG (electromyogram) and NCV (nerve conduction velocity study) are two studies that are often performed together to look for nerve problems (such as carpal tunnel syndrome or a pinched nerve in the neck or back). A needle is inserted into a certain muscle. Electrical impulses are sent through electrodes and recorded through other electrodes. The analysis of the data (often by a neurologist) can help determine the source of the patient's nerve symptoms.